Oh, those silly chickens! 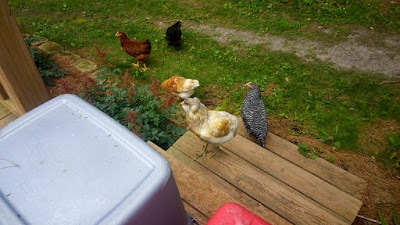 We've had them for 12 weeks now, and my google chicken obsession of the week is "when will my chickens begin to lay?" Answers vary widely, probably because chickens vary widely, but the general consensus seems to be: when they're ready. Or in my mind: any day now. OK, not really. I can tell my chickens are not yet ready because there are some physical changes that occur before chickens begin to lay, and those changes have not happened yet. It sounds like Toasty Crunch, Red, and Austro will probably lay before Rocky and Esther, but I guess we'll find out. And I do mean "we", because you know I'm going to tell y'all. 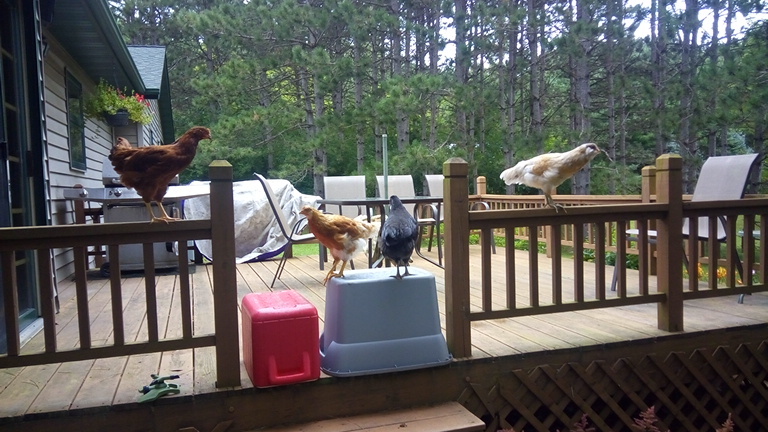 Last week, the chickens were ranging outside while I was in the kitchen making supper. For my family, not for the chickens. I looked out the window to see if I could see the girls, and I couldn't, so I walked over to our glass slider to see if I could see them from a slightly different angle. I could see them all right. All five of them were on our back deck, just looking at me through the door. 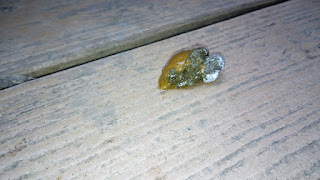 It was very cute, but I shooed them off the deck immediately, and erected a barrier. I knew it was only a matter of time before they realized that they could jump/fly up onto the barricade, and I was right. I guess the good news is, they stayed contained to the railings because the railings are higher than the deck itself. At this point, I decided more drastic measures were called for. So I lured them back to their coop with an apple. They're pretty fast when they're chasing food. Tetherapple. I gave them a tetherbroccoli last night, and for some reason, they weren't quite as enthusiastic about it (they still liked it, just not as much as the apple). Amazingly enough, during all of this excitement, only one of the birds pooped on the deck, and that was on a step--easily washed away with the hose. Whew. Also amazing: they haven't gone on the deck since. Whew again. This week, the girls are looking close to fully grown. I think they'll get a little bigger, but not much. Austro still has the most developed wattles, and her comb is a lovely rose color. We raised the roost this week, and are planning to raise it one more time in the next couple of weeks. We'll also open the nest boxes in the next couple of weeks--I'd like them to be open before the girls are 16 weeks. 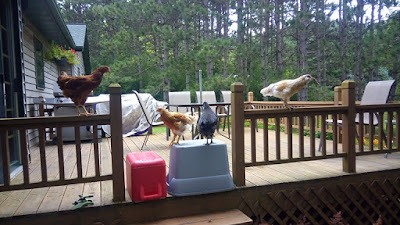 Even though I haven't made any efforts toward training the girls to come to my voice (this is a useful skill to teach, so if I see danger in the yard, I can get them quickly back to the safety of the coop), they do answer me when I call, and in general, when they're out ranging, and I step into their coop and call, they come. Chicken butts are so, so fluffy. Either I forgot, or somehow I didn't notice when I was taking care of friends' chickens. I love the fluffy.